Red Lake is an enclave within Unorganized Kenora District. The municipality was formed on 1 July 1998, when the former incorporated townships of Golden and Red Lake were merged along with a small portion of Unorganized Kenora District. The name of the town comes from a local legend telling of two men from the Chippewa tribe who stumbled across a large moose. They then proceeded in killing the moose, the blood of which drained into a nearby lake. This turned the lake's waters red in colour, which gave the area its name. Aerial view of Red Lake 1936. Log boom full of saw logs at McDougall's Sawmill is visible at bottom right. According to archeological surveys in the area, it is proposed that the First Nations people have inhabited the Red Lake area for 2,000 years. The first people to live in the land were members of the Sioux and Cree tribes. Approximately 200–300 years ago the Ojibwe people began to inhabit the area, effectively becoming the predominant people at the time. In 1897, the R.J. Gilbert expedition discovered gold and staked 8 claims. These were surveyed by J.B. Tyrrell, brother of Joseph Tyrrell, and a rock sample from an 8-meter shaft assayed 0.6 ounces gold per ton. However, the remoteness of the site precluded further exploration until 1922. A report by Department of Mines geologist and former head of geology at Queen's University Dr. Everend Lester Bruce indicated gold-bearing quartz was to be found in the greenstone around the lake. Fred Carroll then staked what would become the Cochenour-Willans Mine, and Herbert Tyrell staked what would become McMarmac Mine on McKenzie Island. In 1925, Lorne and Ray Howey, along with brother-in-law George McNeely, plus W.F. Morgan staked claims which became the Howey and Hasaga Mines. Marius Madsen staked claims which became the Madsen Mine. The McDonough brothers staked the future Red Lake Gold Shore Mines. The town experienced a sudden surge of economic, industrial, and population growth with the discovery of gold in 1926. In fact, by 1936, Red Lake's Howey Bay was the busiest airport in the world, with more flights landing and taking off per hour than any other. By 1941, the Howey Mine had produced 421,592 ounces of gold. Hasaga Gold Mines produced 218,213 ounces over 14 years. McKenzie Red Lake Gold Mines produced 651,156 ounces by 1966, the Madsen Mine produced 2,416,609 ounces by 1976, and the Cochenour-Willans Mine produced 1,244,279 ounces by 1971. Jack Hammell developed Uchi Lake which produced 114,467 ounces by 1943. H. Dewitt Smith developed the Berens River, which produced 157,341 ounces by 1948. George Campbell started the second Red Lake gold rush in 1949 with the development of Campbell Red Lake Mines. It produced a peak of 300,472 ounces in 1993, the same year cumulative production reached 8,000,000 ounces. The Dickenson Red Lake Gold Mine had produced 3,000,000 ounces of gold by 1993. In 1995 Goldcorp, owners of the Red Lake Mine, discovered that it contains the world's richest grade gold ore (two troy ounces of gold per metric ton). Shortly thereafter, the mine suffered through a four-year-long miners' strike. Since then, the mine has become one of the richest gold mines in the world. The climate of the area is warm-summer humid continental (Köppen Dfb). Snow usually starts falling around late October or early November, and starts melting around March but is not normally fully melted until late April, whilst late-season snow in May is not rare. This long winter is ideal for the local snowmobilers and for ice fishing though during this period, although the wind is often very cold and temperatures may drop to below −35 °C or −31 °F. During winter, residents and visitors participate in snowmobiling, ice fishing, skiing, ice hockey, and downhill sliding. During the summer, the area experiences a moderate climate with little humidity, which is ideal for camping, boating, canoeing, and hiking. The three primary sources of employment in Red Lake are support services for the numerous mines surrounding the town, small scale logging and a tourism sector specializing in hunting and fishing. It is known as the "Norseman Capital of the World", referring to the Noorduyn Norseman aircraft which played a significant role in the development of the area. 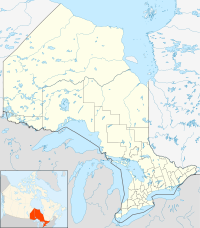 Red Lake is located at the northern terminus of Highway 105, and is the northernmost town in Ontario that is located on a primary King's Highway. A short spur route, Highway 125, extends northerly from Highway 105 to the communities of Balmertown, Cochenour and McKenzie Island, while Highway 618 extends westerly from Highway 105 to the communities of Madsen and Starratt-Olsen. Only one highway in the province, the secondary Highway 599, extends further north than the terminus of Highway 125. The town acts as a cargo, passenger and tourism hub for Northwestern Ontario. With Pickle Lake, Red Lake services over twenty northern fly-in communities. Today, Red Lake Airport is a "mini-hub" facilitating travel to and from all northern communities in Northwestern Ontario. Four airway companies take advantage of Red Lake's close proximity to the northern communities. North Star Air, Bearskin Airlines, Superior Airways, and Wasaya Airways all operate out of "YRL". Red Lake has the Red Lake Regional Heritage Centre, a museum of local art and history, and is close to Woodland Caribou Provincial Park and Pakwash Provincial Park. Some local restaurants are Antonio's, Spud&Dog, and The Howey. Red Lake is a prime location for summer sport fishing, as the lake contains several types of fish including walleye, northern pike, lake trout, whitefish and sauger. Other popular recreational summer activities include golfing at the Red Lake Golf and Country Club, swimming at Rahill and Kinsmen Beach, and even exploring the many bays and arms of Red Lake by boat. Hunting is another activity in the region that attracts tourism, especially during the fall season. Red Lake is known for its abundance of game in the District, including moose, ruffed grouse, spruce grouse, duck, and bear. Some citizens even participate in the fur industry with established trapping lines interspersed throughout the local forests. The gray wolf, white-tailed deer, red fox, beaver, and many bird species also inhabit the area. The town received international attention when a vegan resident of the town, Christine Loughead, rescued a lobster she named Lobby Joe, from being killed, by buying it from a grocery store it was up for sale. She then arranged for it to be transported to Halifax, Nova Scotia, so that it could be released into the Atlantic Ocean thousands of km away. Loughead used a vegan Facebook group from Halifax to get in touch with Beth Kent of Bridgewater, who received the lobster and released it in a cove in the Atlantic. Loughead drove Joe, six hours to Winnipeg the nearest UPS outlet that transports live animals. From there it was a 24-hour journey to its destination. Lobby Joe survived the over 30 hour journey well enough to scamper over the rocks and dive into the cove waters when he was released by Kent. Loughead likened her action to those who helped black slaves escape using the Underground Railroad. Lobsters exhibit biological immortality and the oldest lobster on record has been found to be 100 years old. Norval Morrisseau, renowned Anishinabe artist sometimes called the "Father of Woodland Art"
The Northern Sun News is a weekly broadsheet newspaper serving Red Lake and the surrounding Northern Communities. Circulation of 1600. On August 28, 2015 it announced via Facebook that its last issue would be September 2, 2015. ^ a b "Census Profile". 2016 Census. Statistics Canada. Retrieved 2018-01-20. ^ a b "Red Lake A". Canadian Climate Normals 1981–2010. Environment Canada. Retrieved 9 April 2014. ^ a b "Red Lake History". ^ a b Barnes, Michael (1995). Gold in Ontario. Erin: The Boston Mills Press. pp. 65–73. ISBN 155046146X. ^ a b "Corrections and updates". Statistics Canada. 2012-09-19. Retrieved 2012-10-12. ^ "2011 Community Profiles". 2011 Canadian Census. Statistics Canada. July 5, 2013. Retrieved 2012-04-03. ^ "2006 Community Profiles". 2006 Canadian Census. Statistics Canada. March 30, 2011. Retrieved 2011-05-24. ^ "Lobster rescued from Ontario grocery store tank and flown to Nova Scotia". www.cbc.ca. Retrieved 2016-06-15. ^ Kassam, Ashifa (2016-06-01). "Canada vegan helps lobster make epic journey from supermarket to ocean". the Guardian. Retrieved 2016-06-15. ^ "A woman 'rescued' a lobster from a grocery store and shipped it back to Nova Scotia". For The Win. 2016-06-06. Retrieved 2016-06-15. ^ "'You are now not dinner': Vegan goes to great lengths to save lobster from dire fate". Washington Post. Retrieved 2016-06-15. ^ Liputan6.com. "Unik, Beli Lobster Harga Jutaan Rupiah untuk Dilepas Lagi". liputan6.com (in Indonesian). Retrieved 2016-06-15. ^ 陳冠東. "【有片】離家三千公里　加國善心純素者送超市龍蝦回原產地". 香港01. Retrieved 2016-06-15. ^ "Canadian woman saves lobster and returns it home via 3000 km journey". news. Retrieved 2016-06-15. ^ "Vegan buys lobster from supermarket and ships it back to ocean". Mail Online. Retrieved 2016-06-15. ^ Metro.co.uk, Harley Tamplin for (2016-06-03). "Woman buys lobster, drives six hours to send it back to the sea". Metro. Retrieved 2016-06-15. ^ "Vegan spends $250 on buying a lobster so she could release it back into the ocean (+Photos) - EnterGhana.com". EnterGhana.com. 2016-06-03. Retrieved 2016-06-15. ^ "Vegan buys a lobster from a supermarket and shipping it to be released into the ocean | Latest stories from the United States". usa.hir-portal.hu. Retrieved 2016-06-15. ^ "'You are now not dinner,' Vegan tells store lobster before return to Atlantic Ocean". Particle News. 2016-06-03. Retrieved 2016-06-15. ^ "#LobsterLivesMatter: Vegan compares lobster rescue to Underground Railroad". fisherynation.com. 2016-06-04. Retrieved 2016-06-15. ^ Delinsky, Barbara (2005-01-01). Does a Lobsterman Wear Pants?. Down East Books. ISBN 9781608934386. ^ Heroux, Devin (22 June 2018). "Hometown Pride: Eric Radford is now a hero in the place where he was bullied as a kid". CBC Sports: Figure Skating. CBC Sports. Retrieved 23 June 2018. ^ "The Northern Sun News". www.facebook.com. Retrieved 17 April 2018. Wikimedia Commons has media related to Red Lake, Ontario.